Wyandotte County – Page 1541 – Welcome to Wyandotte Daily! A study of the Wyandotte County Jail released Jan. 28 at a Unified Government Commission meeting recommended separating juveniles from adults, into separate buildings. The study by Treanor Architects, HOK Architects and CGL Companies produced a report, the Jail Needs Assessment and Feasibility Study. The study predicted an adult jail population of 847 adults by 2045, and a decreased juvenile jail population of 33. Currently the jail has a capacity of 489 adult beds and 48 juvenile beds, according to the report. The jail, which opened in 1989, has been overcrowded for quite some time, and has farmed out about 150 inmates to nearby jails, according to the study. If a new juvenile jail facility was built, it would make room for more adults to be housed at the county jail, instead of farmed out to neighboring counties, the study reported. According to the study, more than $1.97 million was spent on farming out inmates to other counties in 2014. According to the study, it could be less expensive to build a new facility than to continue farming out inmates. The jail study included different options, with different phases. The options on construction of a new juvenile jail were $18 million up to $27.8 million, according to the study. There were other costs attached to other phases. One option called for a new juvenile facility near the family court and across the street from the existing jail. Another option called for a new juvenile facility at a site to be determined, ideally in a place away from traffic and with green space for a playground area. In one of the plans, the district attorney’s office would be moved to the fifth floor of the courthouse and offices renovated there, into an area that was formerly a jail. The area currently serving as offices for the district attorney would be turned into a space for more jail beds. Other alternative ideas for increasing jail space also were discussed in the report. One of the UG commissioners was hesitant about the cost of the proposed facility. “I have accepted a long time we need a separate juvenile facility,” Commissioner Hal Walker said. “My idea of what a juvenile facility should be is more spartan than what you are proposing.” He suggested a portion of the existing old federal courthouse could be used. He said if there are 35 to 40 juveniles in the jail, it’s because they’re pretty bad actors. The county is not keeping people in there because they broke a mailbox or a window, it’s because they need to be in a secure facility, he said. “Everybody else has been let go,” he said. He thought the citizens would find it hard to accept spending $30 million on a facility that had a lot of amenities. Just a residential building with 35 to 40 rooms with appropriate bars and locks would be enough, he felt. “I frankly don’t think the people of Wyandotte County have the stomach to swallow $30 million to build some of the things you have suggested,” he said. While he said the consultants did a good job on the study, he said he didn’t think there would be any willingness to spend the money at this time. The consultants said that while a simple juvenile jail could be built, they are finding that in order to stop future behavior and recidivism that they need to find out why the child came to the facility in the first place and remedy that. If they go the same route as the current facility, investing as little as possible into solving problems, then the juvenile numbers would grow, they believe. Another UG official pointed out that the county would be paying for the new facility out of money it is already paying to farm out inmates, so that it would not be an added expense. Mayor Mark Holland said the jail study would be evaluated by the jail population study group that would come back with a plan in about 60 days on how to move forward. The jail study, a lengthy document, is online at http://wycokck.boardsync.com/Web/UserControls/DocPreview.aspx?p=1&aoid=158. After a sunny day and a high of 43 on Thursday, weather will continue to be in the 40s through Sunday, according to the National Weather Service. 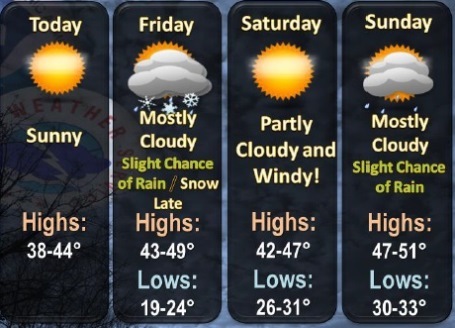 Friday’s high will be 46, Saturday, 45, and Sunday, 48, the weather service said. Temperatures start dropping again on Monday. While there could be a brief rain or snow shower Friday night south of Kansas City, this activity should be insignificant, according to the weather service. Rain or snow showers will be possible Sunday night and Monday, primarily east of the Kansas City metro area, the weather service said. Today, a light south southwest wind will become west southwest 8 to 13 mph in the morning, according to the weather service. The low tonight will be 24. Friday, the high will be near 46 with mostly cloudy skies, the weather service said. A light and variable wind will become south 5 to 9 mph in the morning. Friday night, the low will be around 28, with a south wind around 7 mph changing to west northwest after midnight, according to the weather service. Saturday will be mostly sunny with a high near 45 and a west northwest wind of 6 to 8 mph, the weather service said. Saturday night, the low will be around 34, with partly cloudy skies. Sunday, expect mostly sunny skies with a high near 48, the weather service said. Sunday night, the low will be around 29 with mostly cloudy skies. Monday will see a drop in the high temperature to 37, with partly sunny skies, according to the weather service. It will be breezy. Monday night, expect a low of 20. Tuesday, the high will be a chilly 30 degrees with mostly sunny skies, the weather service said. Tuesday night’s low will be around 17. On Wednesday, skies will be mostly sunny with a high near 37, according to the weather service. Providence Medical Center is the new naming rights sponsor for the former Cricket Wireless Amphitheater, now known as Providence Medical Center Amphitheater at 633 N. 130th St. in Bonner Springs, Kan.
Providence Medical Center, 8929 Parallel Parkway, has been a Wyandotte County institution since 1920, and was formerly a member of the Sisters of Charity – Leavenworth Health System. The hospital, five miles east of the amphitheater, was acquired in 2013 by Prime Healthcare Services. 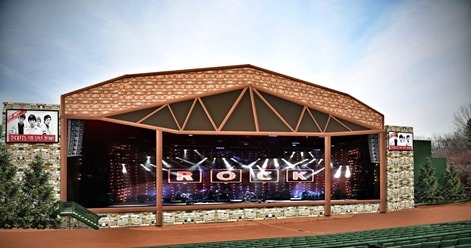 In addition, the landmark venue will undergo a multi-million dollar remodel that are expected to be complete when the amphitheater kicks off its 2016 season in May. Originally called Sandstone Amphitheater when it opened in 1984, the outdoor theater next to Wyandotte County Park, Bonner Springs, has a long history. Thousands of acts and millions of fans have attended concerts over the course of its 30-year history. It is one of the largest music venues in the state. It also was formerly Verizon Wireless Amphitheater and Cricket Wireless Amphitheater before the latest announcement. “The amphitheater has always had a great layout, a wonderful atmosphere and incredible sound. The renovations will make the venue a state-of-the-art facility for both fans and artists” said Chris Fritz, president of New West Presentations, the operator of the amphitheater. The last big renovations at the amphitheater were in 1991, when about $3 million was spent. An $865,000 bond issue was passed by the Unified Government last summer to help finance the remodeling. The UG owns the amphitheater. Providence Medical Center Amphitheater is located near a major tourism and entertainment district in Kansas City, Kan., which includes Kansas Speedway, Legends Shopping Center, Children’s Mercy Park, Community America Ballpark, and the future home of the National Soccer Center, along with numerous hotels and restaurants. The amphitheater is located near I-435 and I-70 in Wyandotte County. Visit www.providenceamp.com for more info.